apartment of 70 sqm, 2 bedrooms, bathroom, living room, kitchen and porch. 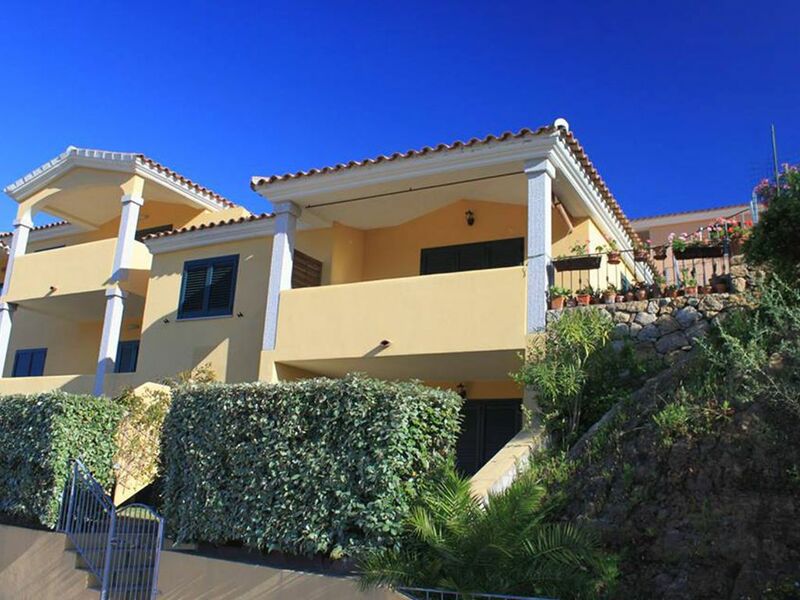 Located in Residence 'Village Smeralda' a few kilometers from the sea of ​​San Teodoro and its beautiful beaches, it enjoys a beautiful landscape typical of Sardinia in a quiet area surrounded by the Sardinian countryside. Inside the village you can take advantage of a large swimming pool, in addition, each apartment has its own private parking space. The apartment consists of: living room with sofa, armchair, TV and modern kitchen, bedroom with two single beds, double bedroom, for a total of four beds, bathroom (with washing machine) and finally small veranda that overlooks a outdoor garden, where we can also find a small shower. Suitable for families (non-smoking), children welcome, pets NOT allowed. The owners were adorable. So friendly, welcoming and helpful throughout our stay. The property was cosy and had everything we needed for a family with two young children. It is located in a valley between San Teodoro and Budoni so you will need a car. Great agriturismo nearby with an excellent restaurant (within walking distance). Also a nice pool if you want a change from the beach. thank you fo your kind words, you have been some lovely guests with Emma and the adorable children, we hope to have you again here in Sardinia in the future. We wish you all a lot of happiness and good luck to Daniel for the new job. Perfectly placed for the costa smerelda. I stayed here with my family in June. We arrived at 10.30pm but the owner not only met us, he also had provided the basics including a welcome bottle of wine. The apartment was immaculate and away from town so you really absorbe the country. You need a car anywhere you stay in Sardinia as you'll want to explore. This apartment was 25mins from Olbia airport and 10 mins to nearest beach la Cinta. We visited 10 beaches in our 14 day stay, they are all stunning. As for the owner Vittorio, he is a legend. Not only was he able to provide details of places to visit (including beaches few know of) he organised for a restaurant to play the England game for us to watch. A true host. If you are thinking of going to the north east of Sardinia this is the place to book. we may meet you for a drink together. Le logement est très propre et fonctionnel, en plus il y fait frais ce qui est très agréable. Il est situé dans une résidence calme avec piscine et quelques transats. A 10 mn du centre de san teodoro (joli village animé le soir) et de superbes plages. Vittorio et Luisa,les propriétaires sont des personnes très accueuillantes, disponibles et pleins d'attentions envers les parents mais aussi les enfants. smoothly solved. Unfortunately we only had a view on the green hedge instead of the beautiful landscape from the terrace. We enjoyed the beach of San Teodoro. assistance during our holiday on your beautiful island of Sardegna. Nous avons passé 15 jours dans l'appartement de Vittorio. L' appartement est bien équipé. Il y a tout ce qu'il faut (sauf peut-être un lave-vaisselle). L’appartement est situé à 10 min des plages de Budoni et San Theodoro et on passe devant plusieurs supermarchés en y allant. La piscine est bien, pas trop de monde même en août. Vittorio est très gentil en particulier avec les enfants. Un bon choix pour la région! Nous avons été accueillis avec beaucoup de gentillesse dans un appartement agréablement frais pour la saison (début juillet!). Les pièces sont spacieuses et le petit jardin privatif ombragé, idéal à tout moment de la journée. La résidence se situe au calme, dans la campagne. Repos assuré! La piscine est au bout de l'allée et les chaises longues autour permettent de se reposer en surveillant les enfants. Les premières plages se situent à une dizaine de minutes, tout comme les commerces les plus proches. Un lieu idéal pour nos vacances en famille. La Sardaigne est magnifique et l'accueil chaleureux des propriétaires nous a comblés. injure, when it is not crowded, for families with children.